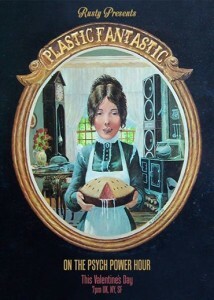 Valentine’s Day: Rusty presents Plastic Fantastic ! This Saturday is Valentines Day, so Rusty had put together a special Psychedelicized Power Hour – Plastic Fantastic: Songs Of Love. Of course, by “love”, we may mean something a little more sordid. Join us Saturday 7PM UK/NY/SF. It will blow your, um, mind.